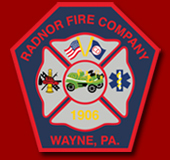 Radnor Fire Company was dispatched at 9:31 Sunday morning for reports of an oil or gas odor in the area of the creek behind the houses in the 300 block of South Devon Avenue in Wayne. Engine 15 and Chief 15 arrived on scene and quickly identified the source of the odor to be a heating oil drum located on the exterior of a garage apartment. Firefighters and residents found a thin layer of oil on the surface of the creek. Rescue 15 and Squad 15 arrived on scene with oil containment socks and blankets which fire fighters strategically placed at several locations along the creek to help contain the material. Radnor Township officials were notified of the incident and were on scene investigating. All apparatus and firefighters were cleared from the scene by 11 a.m.